Bob Hall gave a lovely talk on wages, and how a reduction in the cost of capital from tax or regulatory reform might raise capital, and by doing so raise labor productivity and hence wages. The graphs speak for themselves. The cost of capital should move inversely with the stock market -- at higher prices, investors are willing to accept lower expected returns. In any case, if you graph them together the cost of capital graph does NOT track the stock market. Huge measurement issues all around. 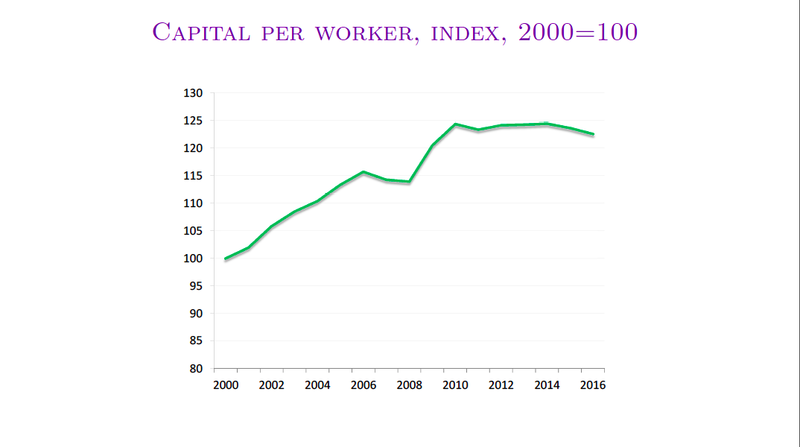 The capital per worker graph is wrong. More and more capital is software. The price deflator for software hasn’t moved in 30 years, yet quantity (measured by lines of code/function points, compiled size, etc) per $ has increased by roughly 1,000,000 over the same time frame. 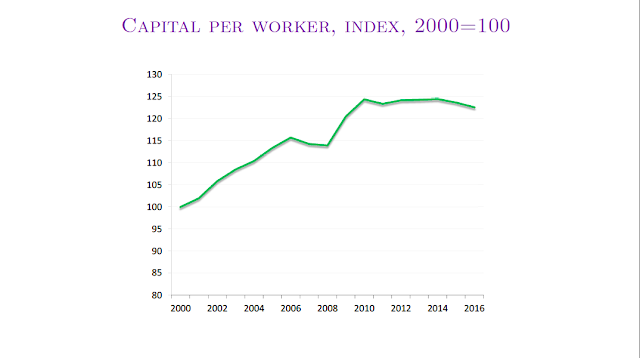 So your real capital per employee number is way off. Also, the earnings figure neglects the fastest growing component of total compensation: employer contributions to healthcare. This is now like $12,000 per employee and up to $25,000 in some unionized cases. So, that number is also way off. End result: you don’t know. Get the basics of science down first: measurement. Great point. Do we know that he excluded these items? Is there a way to get the full talk? Thanks. Seconded. Nothing along these lines on his web site. So this seems to make the opposite case. 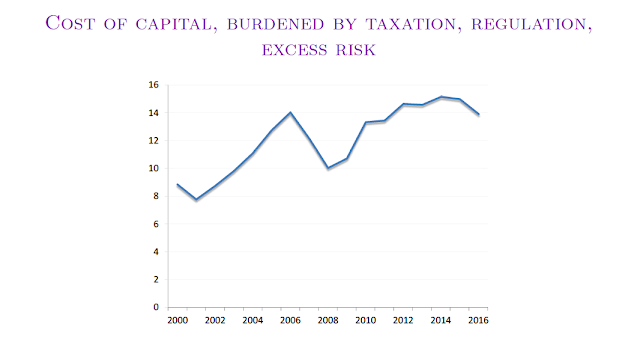 I already mentioned this in your previous post regarding Greg Mankiw's article but I thought I would bring it up here again, since Mr. Hall does not in his graphs look at after tax wages or interest rate effects on budget deficits. 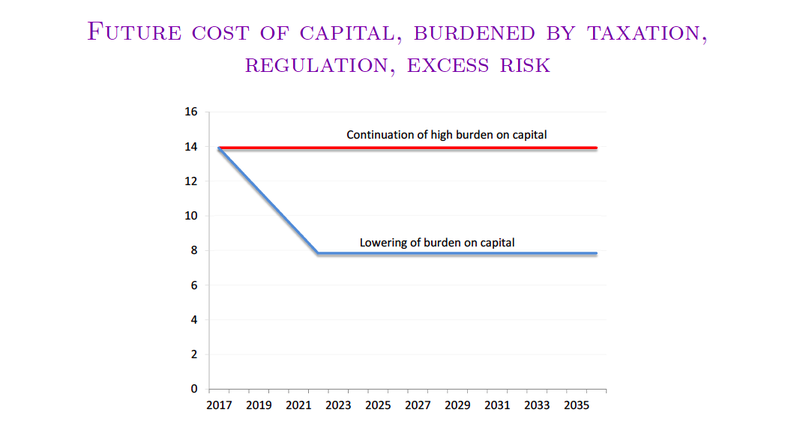 Okay, so the cost of capital is lowered through tax policy. The federal government could decide to counterbalance lost revenue by raising taxes on wage earners in trying to maintain a balanced budget. And so, what ever pre-tax gains wage earners might make on a pre-tax basis, they could lose on an after tax basis. Another thing that can happen is that the federal government does not try to counterbalance the lost revenue from lower taxes on capital - they fund the tax policy induced deficits with bond issuance. Absent central bank intervention that could push up bond yields. 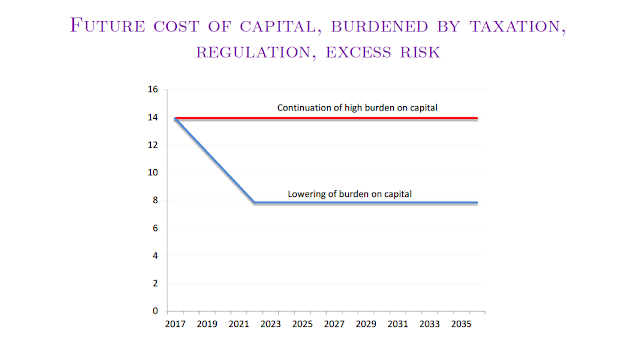 In this case, the after tax cost of capital could remain unchanged. Whatever is gained in tax policy changes is lost in interest rate changes. 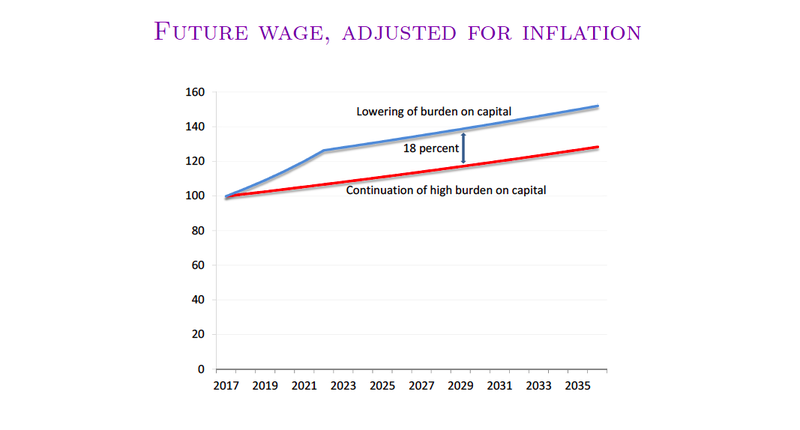 I wonder where Hall got his wage numbers for the first graph? 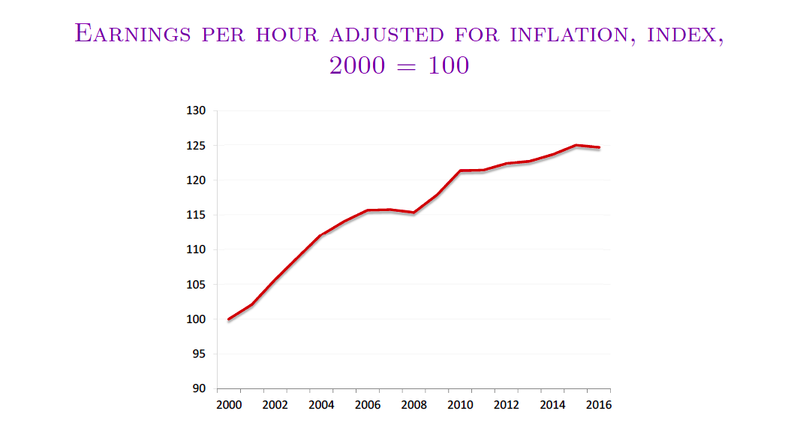 This above FRED series, "Nonfarm Business Sector: Real Compensation Per Hour" shows wages up perhaps 12-13% since 2000, not the 25% shown. Does the cost of regulation include extensive property zoning? I would guess property zoning is the biggest regulatory burden on US business and output today. How does inflation work anyway? Tyler: Equity financed banking is possible!